There were fourteen of us from 9 to 89 years of age to celebrate the birthday of our capogita. It was a Triestine lunch on the Carso. The trattoria has an upscale decor – a blend of Scandi minimalism with solid Carsic stone sculptures. The traditional Triestine cotto and jota have been updated but have not lost any of their traditional tastes. Tom Oberdan is the chef and co-owner with his wife who runs the dining room. With fourteen people across a number of generations the special menu that was proposed for us was enjoyed by all. The antipasto was “Il cotto caldo tagliato a mano, servito con la senape e con il cren un “simbolo” enogastronomici di Trieste”. Roughly translated “cotto” is a slow cooked ham and is served with grated horse-radish and mustard. This was no ordinary “prosciutto”. The chef explained to us that the ham comes from the mangalica pigs raised in the high altitudes of Hungary. These pigs are what Kobe is to beef. The pigs are free to forage in the woods for acorns, chestnuts etc. Living in the high altitudes they have to put on a natural fat to protect themselves from the cold. Wow! Is all I can say. Light and just melt in your mouth tasty and to top it all off , beautifully presented with a very much appreciated respect for the traditional cotto. Just a delight to all the senses. Then a primo of pasta or jota. I opted for the “bleki” or “maltagliati” pasta with a “sugo di galina”- pasta with a chicken sauce. Those that had the “jota” agreed that is was perfect. 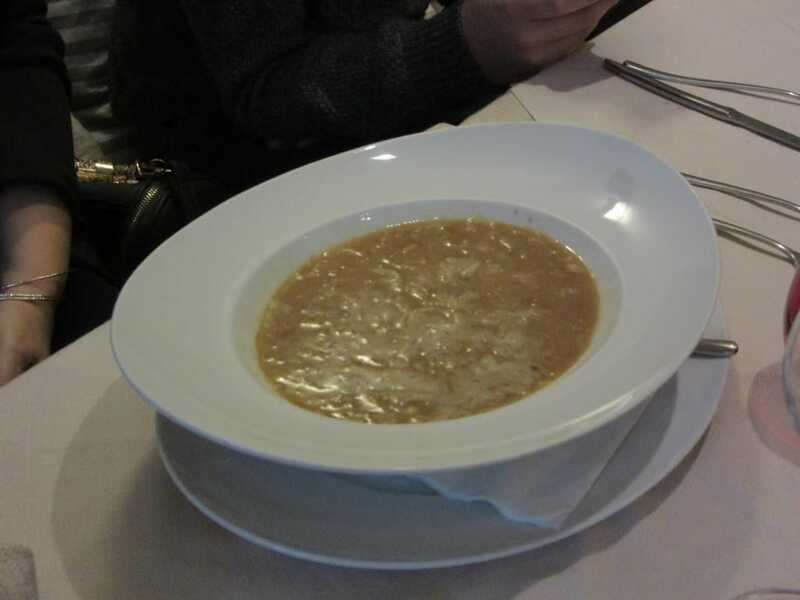 “Jota” is a signature Triestine “soup”. More than likely the origin is more than five hundred years old, a soup made of what was available in the winter months – potatoes, dried beans, garlic, smoked pork ribs and sauerkraut cooked for hours and eaten the next day thick and hearty. Though this one was very much updated to be lighter it was no less tasty. My “secondo” was a “capello di preti” veal roast slow cooked, and tender. There was also a lightly battered fried chicken, again tender and juicy. The youngest among us was more than happy with her breaded pork cutlet and fries – and I was lucky enough to be able to taste one of those crispy fries. You know when the food and service are great if even the nine-year old is treated with the same respect for her culinary tastes as is everyone else. And then I over did it with a machiatto and a chocolate tortina, the centre filled with warm melted chocolate. A delicious birthday lunch for our capogita on the Carso in bella compagnia enjoyed by all. What a lovely lunch. Everything looks so delicious! What a wonderful birthday celebration! Happy Birthday!! All that food description has made me very hungry!! Cheers!